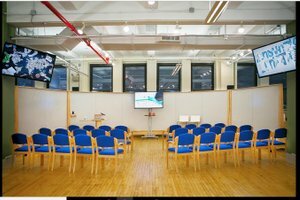 We have a unique space designed to be the best possible facility for workshop events of up to 120 people. 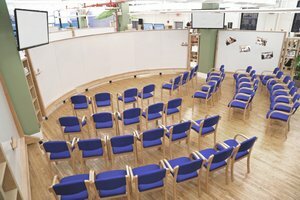 We offer a stimulating, creative and supportive environment meant to be used for sessions of all kinds! All the furniture can be moved out for the clients. Fully configurable. 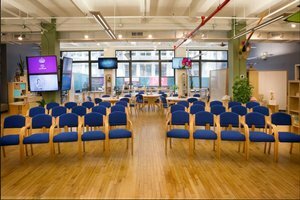 This loft is a creative meeting space in the heart of Midtown Manhattan.13' ceilings, hardwood floors and natural light make this space perfect for a range of activities like workshops, training sessions or PR/marketing events, fashion showroom and photoshoots. 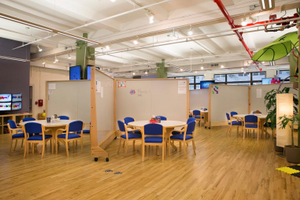 You may rent the space as an open loft or fully configured collaborative environment. Rolling whiteboard partitions divide the space for breakouts and a 27' curved wall creates a plenary area.Tables, chairs and whiteboards are all movable. 30+ flat-panel displays throughout aide in visualizing content. Logos or designs. State-of-the-art sound and lighting systems plus surprising elements add inspiration to your event. Note that pricing information refers to half of the space. In order to rent out the entirely please inquire.